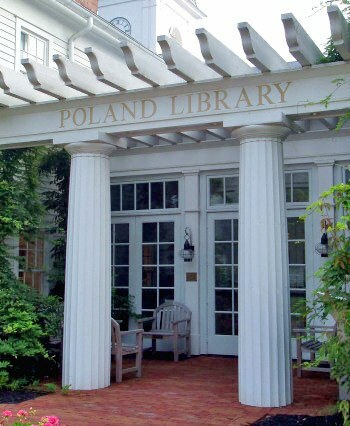 The application of Post & Beam as a structural entity was collectively practiced by many early civilizations – such as the Cretan and the Minoan – that predate the wave of classical Grecian architecture. Architectural intricacies of what is now considered as the Doric Order appeared in Egyptian work, like the colonnade from the funerary temple of Queen Hatshepsut (1480 B.C.). Although elements of the Doric Order observed in the most primitive applications of architecture existed before the canonization of the 5 Classical Orders of Architecture, the Greeks are widely recognized for compiling the strands of architectural thought to form a precedence that could be classified and defined in all its elements. Most notably, the Parthenon in Athens – since the mid 18th century – has been considered as the model of proportions and antiquity. Highly distinguished as the earliest and the simplest of the classical orders, Greek Doric columns have a height (including the capital) between 4 and 6-1/2 times their diameter and consist of a capital and column shaft with no molded base. Instead, Greek Doric columns sat directly on a stylobate, or a tiered step-structure. The column shaft has a convex profile (or entasis) and typically consists of 20 shallow, concave vertical flutes; occasionally, the Greek Doric shafts were left unfluted to give them a more archaic and sturdy look. On fluted columns, the shaft ends when the flutes meet a band of 3 horizontal grooves, or hypotrachelion, at which point the flutes continue upward onto the columns’ neck. The top of the necking consists of horizontal rings called annulets, which signify the end of the column shaft and the beginning of the Greek Doric capital. Above the annulets, the column transitions upward to the capital portion which is first introduced to a convex, cushion-like component called the echinus that supports a plain, square abacus – thus ending the column section of the Greek Doric Order and leading into the Greek Doric entablature. Vitruvius sets the prototype for the Greek Doric entablature, which consists of 3 main parts (bottom to top): the architrave, the frieze, and the cornice. The architrave consists of two bands – the lower band consisting of a flat face and the upper band consisting of flat molding (or taenia) that contains, underneath, guttae – or drops that resemble a cone like shape. There are generally 18 total guttae, broken up into three rows of 6 that lie underneath the mutules. The frieze is most noticeable for its triglyphs that are positioned directly over the column’s center-line as well as directly over the center-line within the spacing of each column. The uppermost portion of the entablature, the cornice, is broken up in two portions – the cymatium and the corona – both of which project over the frieze. 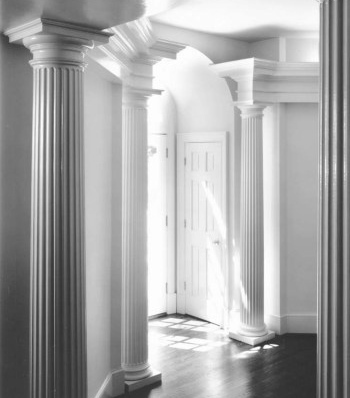 Overall, the Doric Order commonly displays minimal decoration, and according to Vitruvius – Doric columns were traditionally representative in form to the stature of a man’s body because of their broad proportions and utilitarian, structural purposes. 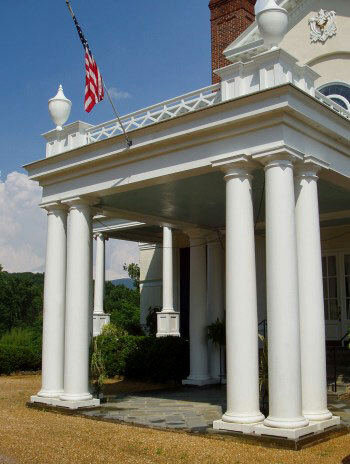 As so, Greek Doric columns are best utilized for projects that require a sense of stability and refinement. Even before the Roman conquest of Greek colonies in southern Italy, Roman architecture’s assimilation of the Grecian architectural form was already in motion. Although Roman architects implemented the Greek’s use of the Doric Order, they gradually made significant modifications to many components of the Doric Order. The Theatre of Marcellus in Rome is an early, prime example of an application that blends both Greek traditional standards and Roman architectural advancements of the Doric Order as a whole. In this paradigm, the columns mimic the Greek Doric style by excluding the base portion of the column and simply resting the shaft on an elevated surface; whereas, Roman influence includes a plain column shaft that is more slender (7.65 diameters high) leading up to a simplified ring, or astragal, that signified the end of the column shaft and beginning of the neck leading up to a Tuscan-like capital. As the Roman Doric Order continued to evolve (throughout 400 centuries), additional modules appeared within the order that are more representative of what is currently acknowledged as the Roman Doric Order, and due in large part to the advancement of printing, we are able to reflect on different versions of the orders from a variety of Renaissance authors and architects. 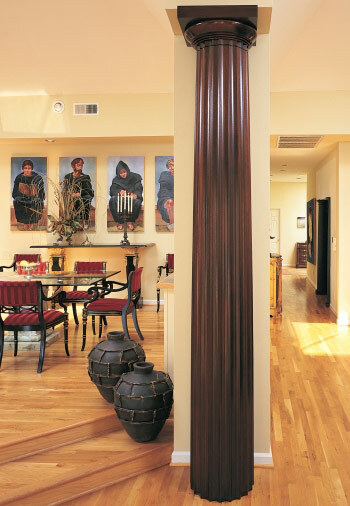 Agreeably, the column is 8 diameters high with a fluted shaft. Also, a base molding and a plinth was added to the bottom of the column shaft to show the termination of the column itself. The two styles of base moldings introduced were the Roman Doric style and the Ionic [Attic] style – both which sat atop a flat, square plinth. The necking of the column, above the astragal, often was adorned with 4 or 8 decorative rosettes or paterae. (See our Renaissance Doric capital). The astragal may be ornamented with a bead-and-reel molding, while the echinus may display a decorative egg-and-dart pattern around the molding. The Roman Doric entablature also experienced modifications as the architrave was occasionally divided into two fasciae that were sometimes plain and sometimes decorated. The frieze maintained triglyphs positioned at the column’s center (and not touching at the frieze’s angles), but the frieze’s metopes were often garnished with rosettes, paterae, or bucrania. The cornice was also more elaborate as it showcased dentils on the bed-moldings, and its soffit was richly decorated with guttae and geometrical moldings spaced between the mutules. Although modified, the Roman Doric Order was still associated with sturdiness and masculinity, and according to Serlio, Roman Doric columns were suitable for the application in churches dedicated to specific male Saints who may have participated in military action. Overall, the Roman Doric Order is observed as simplistic with slight ornamentation, having broad proportions and practical when a project’s objective is to appear firm and stout.